The 21st century is a great time in human history. The latest find, referred to as The Link, was just revealed. This find seems to push human ancestry back to around 49 million years. This is a time when horses were the size of small dogs (see the section Horse Evolution) and there was a bird the size of modern man that had a huge beak. Prior to the Link, human ancestors went back to the primate Sahelanthropus tchadensis – a 7 million year old primate skull. If you want to start there and follow the human evolution tree you are out of luck. We have to travel to 3.8 million years ago (The mark you made just before the end of the tape indicating modern day in the section Understanding Time) and meet Lucy. This is currently beginning of the human line. Actually, even this information changed recently. In 1994 a partial skeleton was found in Africa. They have been doing research on this skeleton and just recently reported that they believe it to be the earliest human – 4.4 million years old. It’s been called Ardipithecus ramidus. 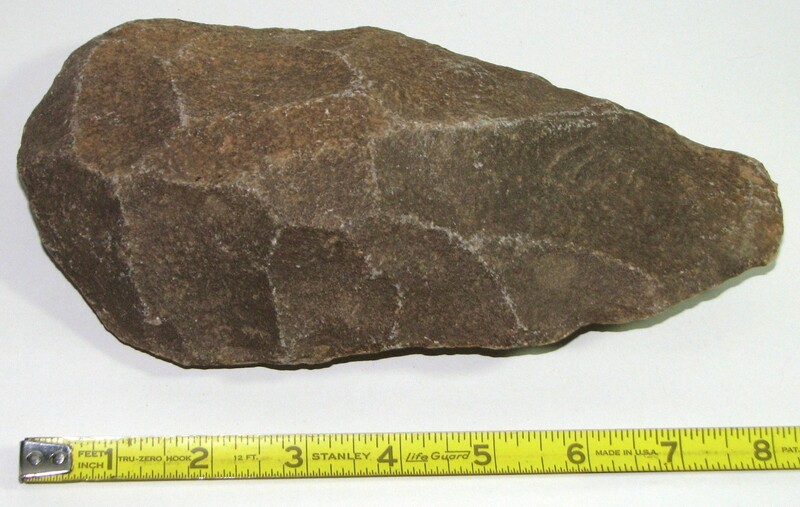 They believe it walked upright, but, at this point in time, there is very little information out about this new find. Perhaps, like they did with Lucy’s kind, they will find more bones and be able to piece together a fuller picture. So, for now, Lucy is the most complete, most human of our ancestors. Trilobites existed for over 200 million years. Stromatolites lived 3.8 billion years ago and are still around today. Dinosaurs existed for around 160 million years. Archaeopteryx indicates that birds have been in existence for at least 144 million years. Horses have evolved over 55 million years and are around today. But, with our current knowledge, humans have only existed for about 4 million years. We are, by far, the new kids on the block. Lucy, labeled “the first human”, is actually Australopithecus afarensis (Australopithecus means “southern ape”, afarensis means “from Afar” – the region in Ethiopia where Lucy was found). Lucy lived 3.8 million years ago and looked very much like a chimp walking upright. She may not have walked exactly like us. She may have walked with her legs bent a bit. She stood about 3 ½ feet tall. The male would have been about 5 feet tall. The original Lucy skeleton was found in 1974 by Donald Johanson in Ethiopia, Africa. Since that time many more A. afarensis (we can abbreviate Australopithecus with A.) skeletal parts have been found … but so far, Lucy is the most complete. We have also found footprints from Lucy’s time preserved in volcanic ash in Leotoli. These footprints indicate that A. afarensis walked upright on two legs (bipedal) much like we do. The bones of A. afarensis indicate that they had a life in two worlds: on the ground and in the trees. Lucy’s arms and hands indicate that she was adapted to both. Even before the footprints we knew Lucy walked upright due to the foramen magnum. The foramen magnum is the hole at the base of the skull where the spinal column goes into the brain. 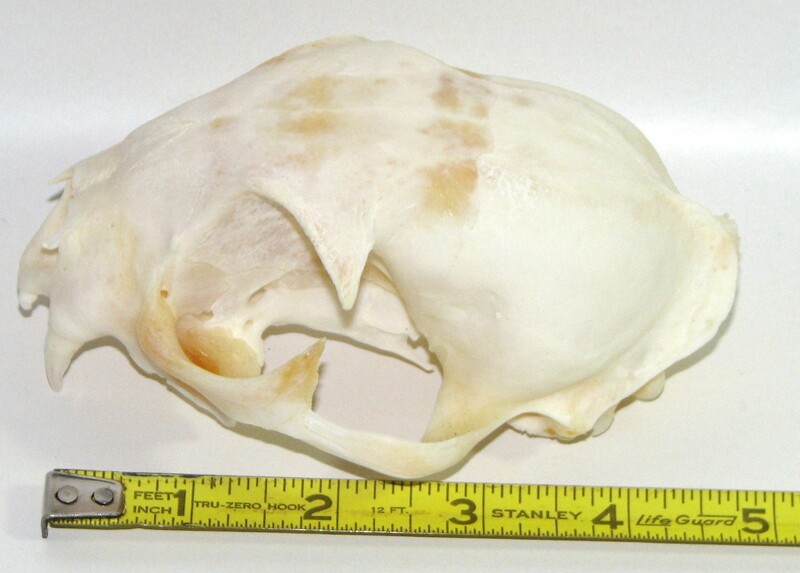 This is the skull of a bobcat. If you put your finger in the foramen magnum (the red arrow) and point the eyes so they look straight ahead you have to tilt your hand. This indicates that the spinal column does not go vertically into the skull. This means that this animal walked on all fours. 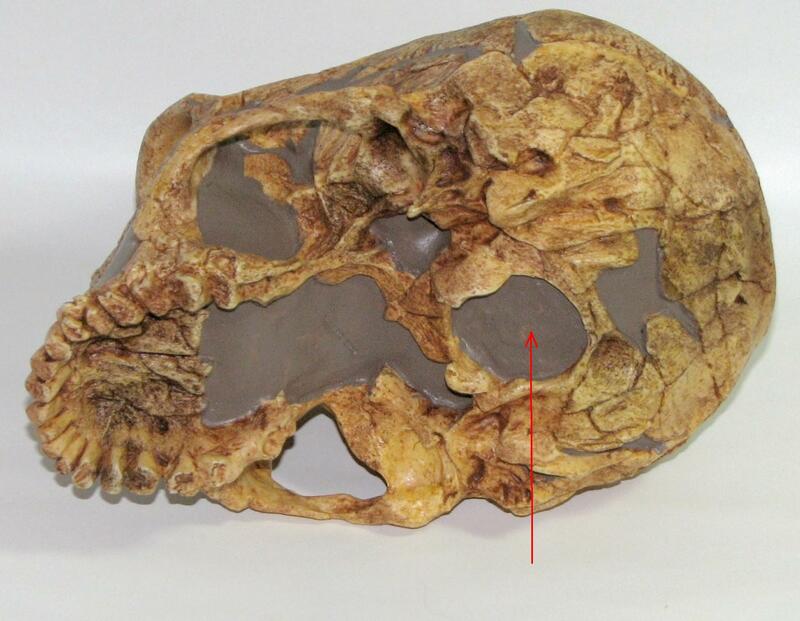 Here’s a reproduction of the human skull (Neanderthal) – bottom view. Try the finger test again. Notice how your finger will point straight up when the skulls eyes look forward? This indicates that the owner walked upright with their spinal column held vertically. Lucy's skull shows the same natural position. 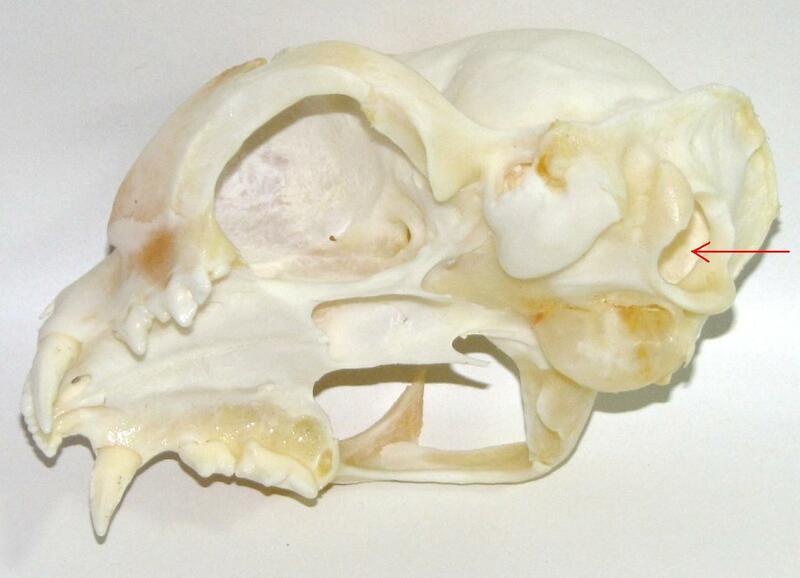 Here is a reproduction of the “Lucy” skull. 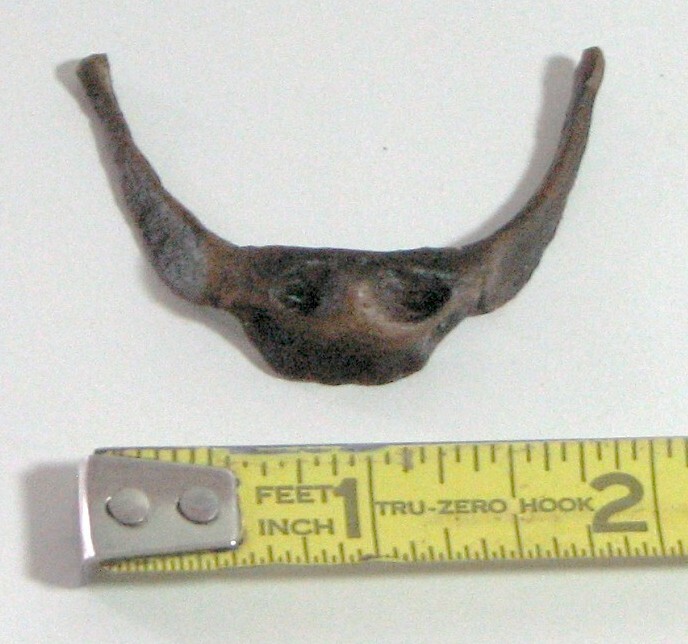 The lighter sections show the pieces of her skull that were found. The dark sections are a reconstruction of the missing pieces. When we looked at the evolution of the horse we found that one horse may or may not lead directly to another along a straight evolutionary line. In the Spitzer Hall of Human Origins in the American Museum of Natural History in New Your City, there is a fantastic display showing the human evolution tree as we now understand it. It shows a very tree-like relationship between known human fossils with some branches leading to us and others leading in a different direction and dying out and some with missing links between them. As more fossils are found and as we learn more about our past this display may change. But for now it gives an excellent depiction of our knowledge of human evolution. To hit some of the highlights of human evolution we’ll look at some of the key humans along the way. This photo will give you an idea of their relative sizes. Sahelanthropus, as we’ve mentioned, is not a true human but, rather, a primate ancestor. He lived about 7 million years ago. Australopithecus afarensis, the “first human”, lived about 3.8 million years ago. Australopithecus garhi (not shown) lived about 2.46 million years ago and may have used stone tools. 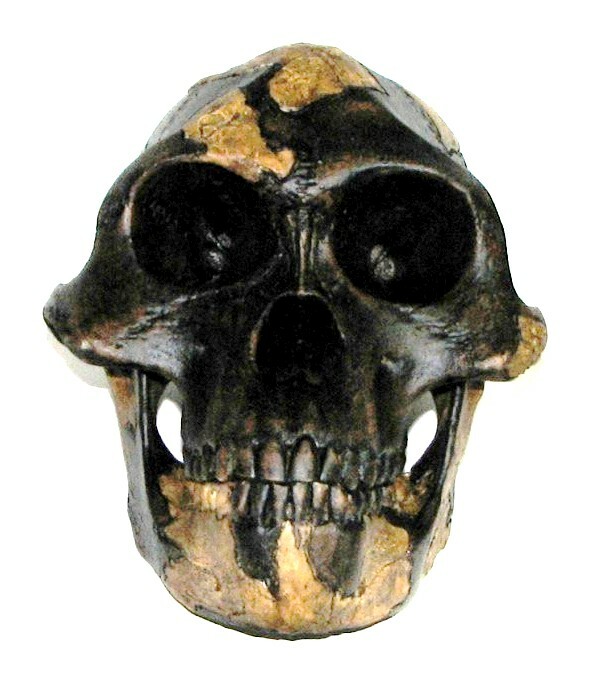 Paranthropus robustus (not shown), who lived about 2 million years ago, may have used stone tools and fire. 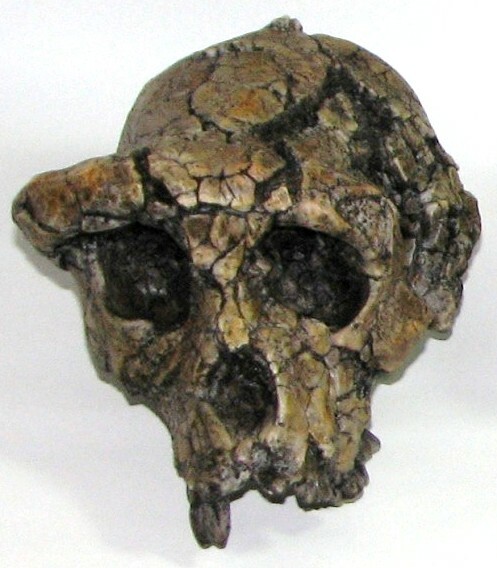 Homo habilis (may be the same as Homo ergaster shown above) used stone tools. The big innovation here was the creation and use of two-faced tools. Homo habilis (not shown) lived about 1.8 million years ago. 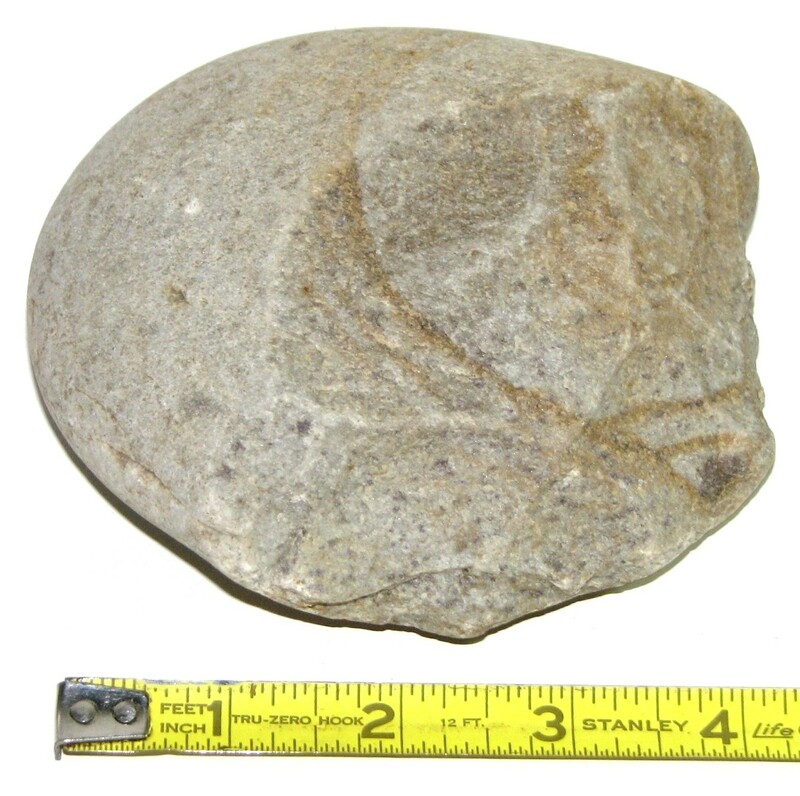 On the left, above, is an early pebble tool. It could be used as a chopper or for digging. On the right is a two-faced tool, a hand axe. Again, it could have been used as a chopper. Currently there is a human ancestor called Homo georgicus who lived 1.77 million years ago. I say “currently” because some scientists believe he may be the same as Homo erectus. 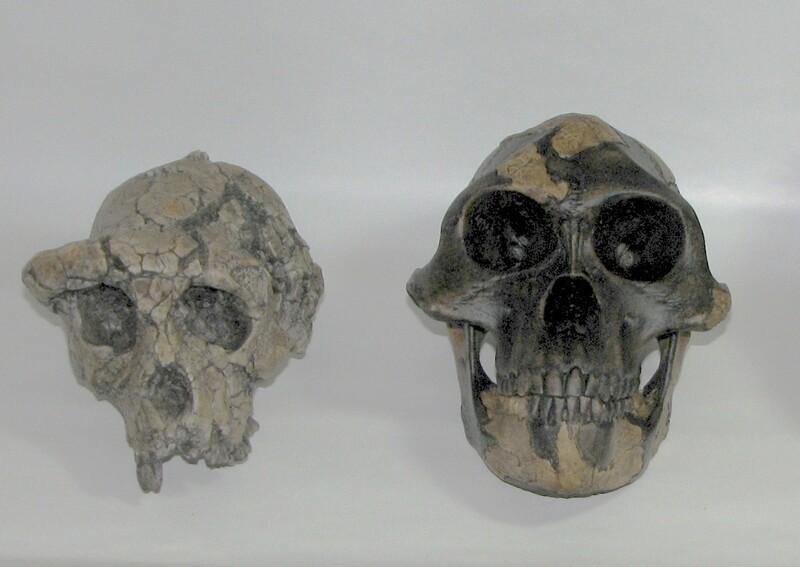 This is just one of the cases where one human ancestor is hard to distinguish from another. There are others. Homo floresiensis lived 74,000 years ago. I’m just mentioning him to show that we are still finding new human pieces in our history. This human was found in 2003. Homo heidelbergensis lived from 880,000 years ago to about 150,000 years ago and may be the ancestor of the Neanderthals and us. One of the most famous human ancestors of all is Homo neanderthalensis. Neanderthal to most of us. Also known as “cave man”. Although not a true ancestor he co-habited the world with Homo sapiens. Neanderthals lived from around 175,000 years ago to about 27,000 years ago. They were robust and shorter than us. They used fire, buried their dead, and took care of those who were old or injured. Recent studies indicate that they had some form of speech. 1. They had a hyoid bone. This is the bone in your throat, the only one not attached to any other bone, that allows you to speak. 2. It has recently been discovered, through DNA analysis, that there is a gene that we have that allows speech. Neanderthal had that gene also. By the way, if you wish to pronounce it correctly you must say “Nee-an-der-tall”. The word is German. The first Neanderthal fossil was found in the Neander valley – which is what the name Neanderthal means: Neander Valley. The last in our line is us, Homo sapiens. Homo sapiens (which means “wise man” –we do know how to flatter ourselves, don’t we? ), the only survivor of the human line, is about 94,000 years old. Further evidence may move this age back to 270,000 years. We are the last of our line and its sole survivor.